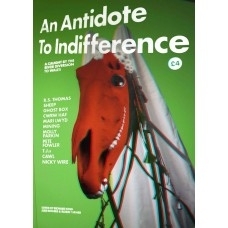 An Antidote to Indifference issue 7 is an all Welsh special edited by long time Caught by the River contributors Jude Rogers and Richard King along with this site’s Robin Turner. As well as a trippy cover by Marc Jones, it features contributions from the likes of Pete Fowler (a five page halluncinogenic Fitch special), Nicky Wire (on the late, great, irate R.S. Thomas), Rob Penn (on woodland) and Jeb Loy Nichols (on his life in rural mid Wales) as well as pieces on everything from guerilla architectural restoration, Welsh weirdness (via Ghost Box records) and the plight of sheep farmers over our last harsh winter.